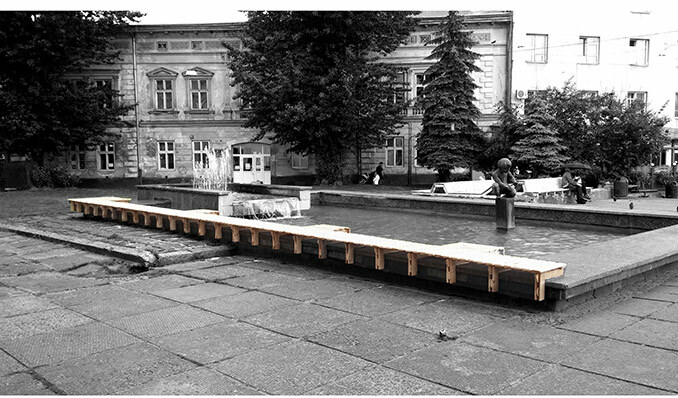 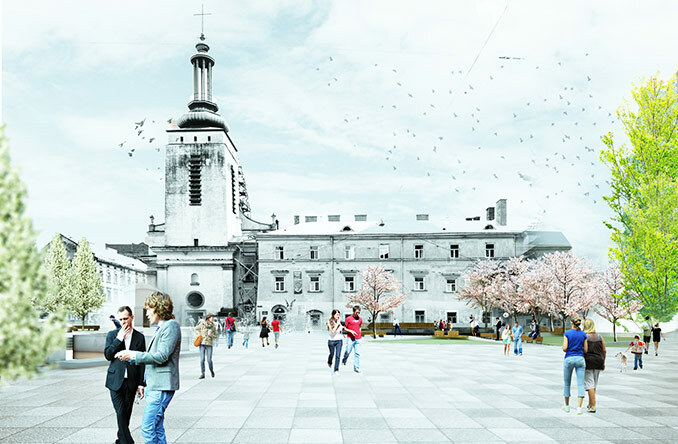 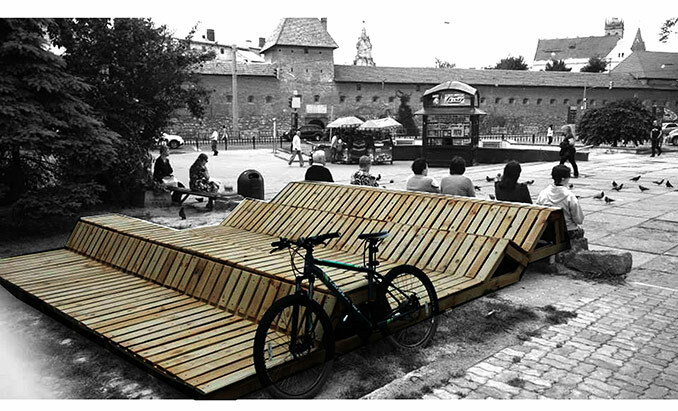 Architectural bureau Ruthenia together with NGO Urbanideas have developed a project of renovation of one of the largest historical squares in Lviv, Ukraine. 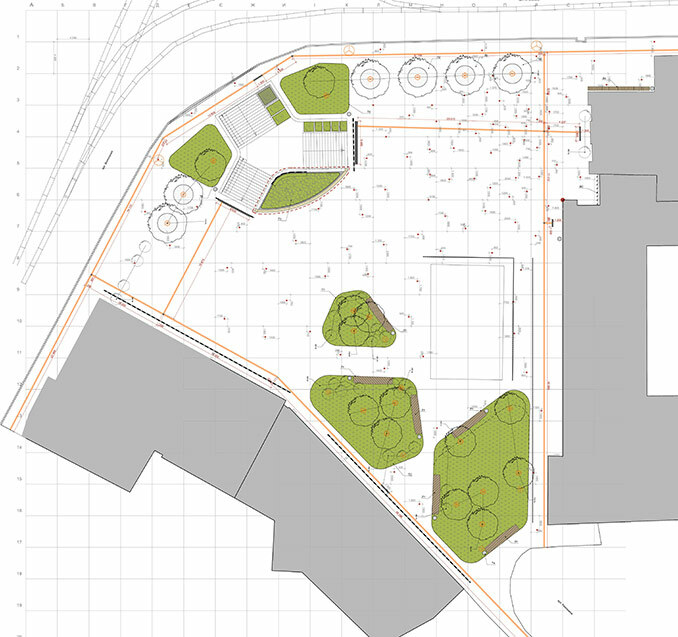 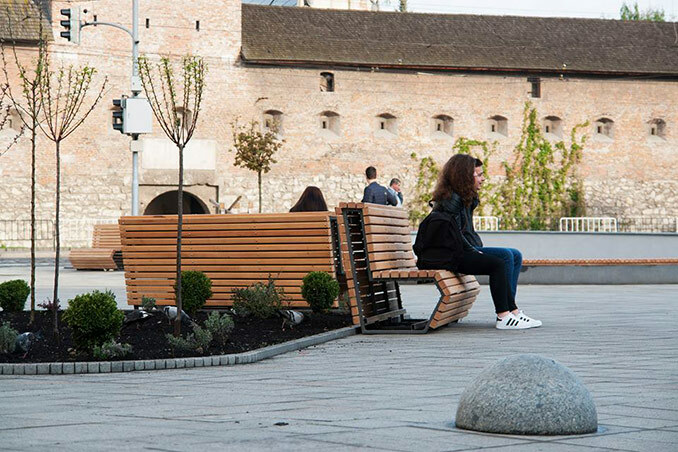 This project, spontaneous parking and chaotic trade were removed from the square and large pedestrian area was created and enriched with water recreation, landscaping and very conceptual lighting in the evening. 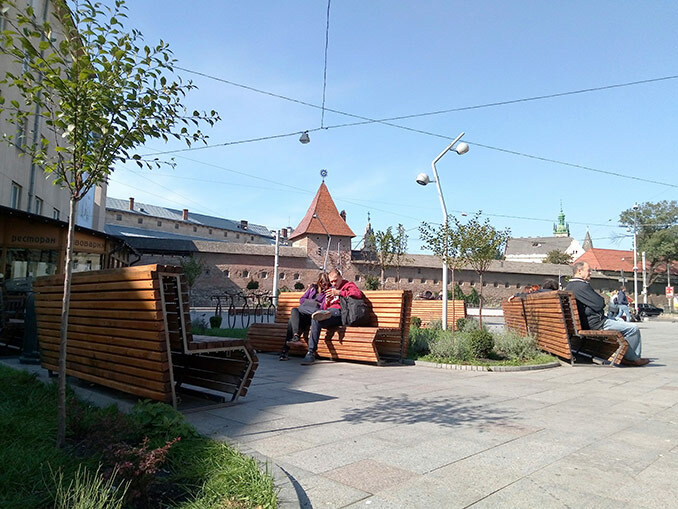 The area is located near the oldest part of the historic city, in front of the Baroque wooden sculpture museum, the former church and monastery of Clarisse’s, opposite the entry gate to the medieval city. 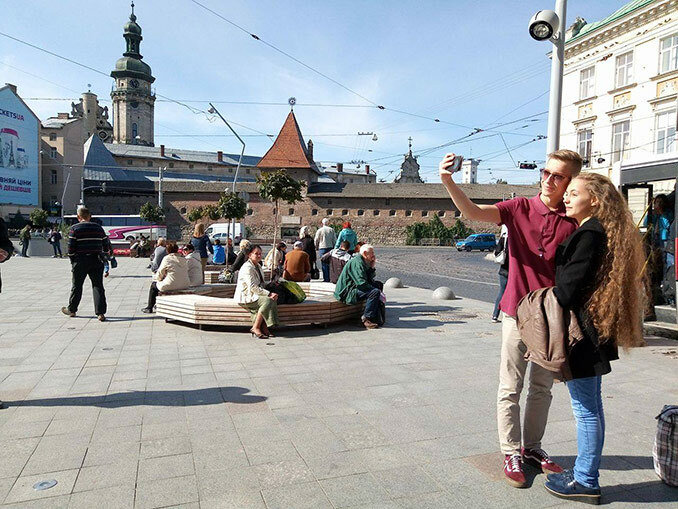 The square was very neglected and with rests of Soviet design. 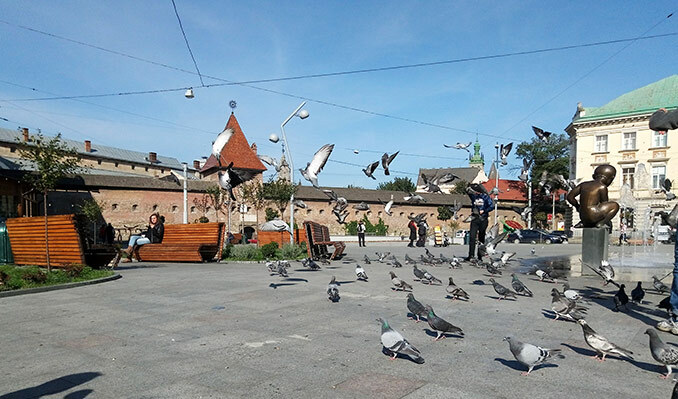 The area no longer fulfilled its functions of public space in the city. 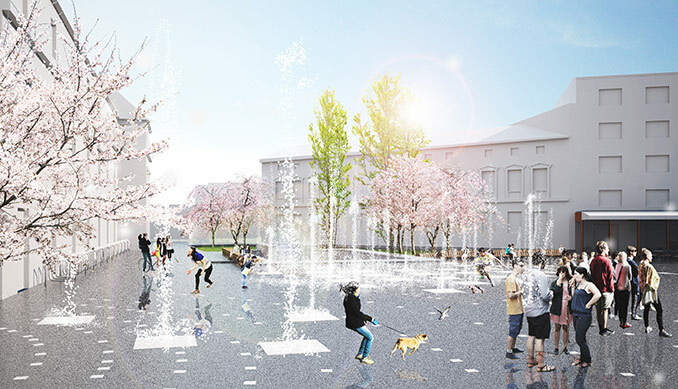 The idea of renovation of the square was to bring life into an abandoned space and to create a place where different events will take place. 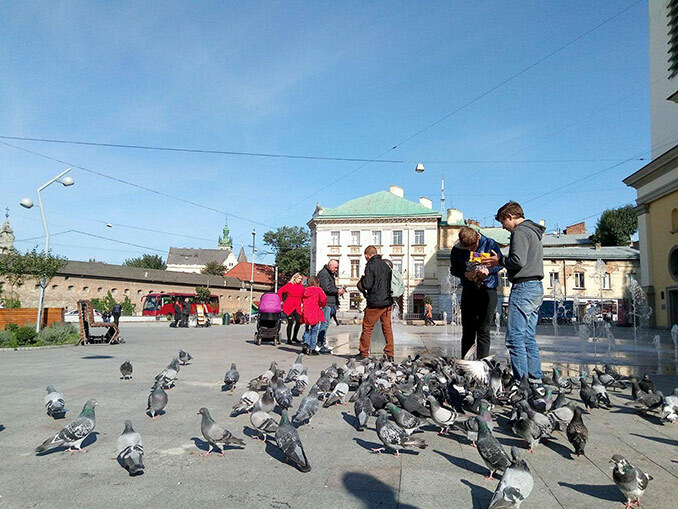 Now here are orchestras, there are dances and performances in the open air, even in the winter there is a Christmas tree. 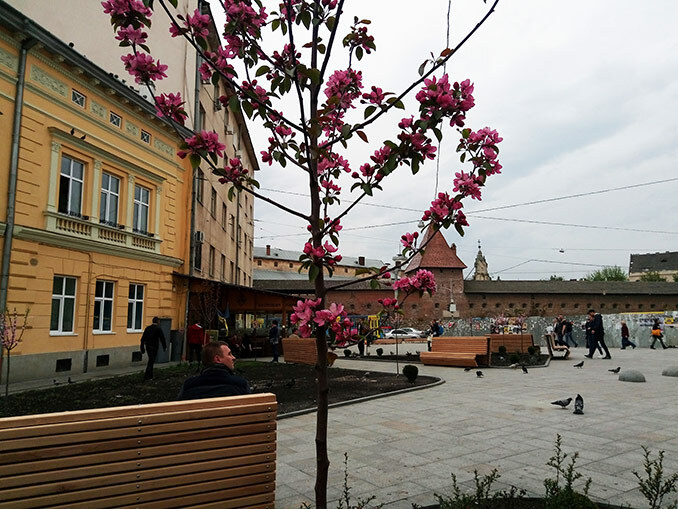 The design and repair processes of the square lasted for almost two years, there were replaced all communications networks on the square, repaired the entrance to the underground passage, replaced the old and very destroyed cover from concrete slabs, reconstructed the old fountain, which was now put in the form of a pedestrian fountain with 25 nozzles, which in different ways rhythm and at different heights emit water like directly from the paving, although in fact under the cover of granite plates is a water reservoir, in place of the the old fountain. 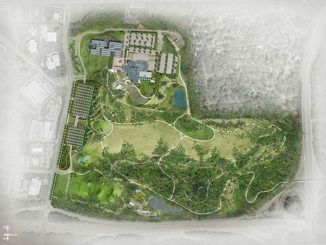 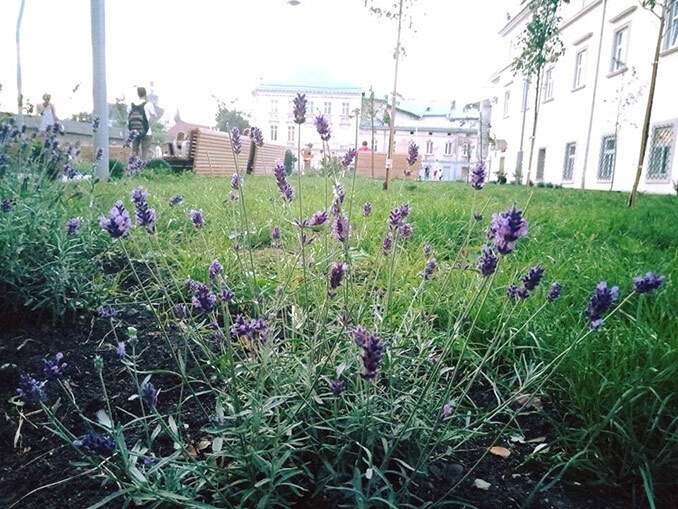 Renewed landscaping provided more than 15 new species of plants, trees and shrubs. 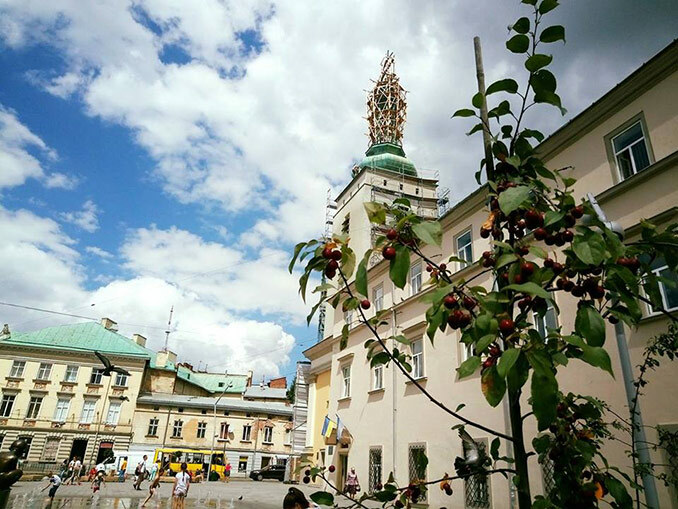 A large number of fruit trees appeared on the square as a symbol of the former monastery gardens that grew up near the monastery of Clarisse’s and in its courtyard in pre-war times. 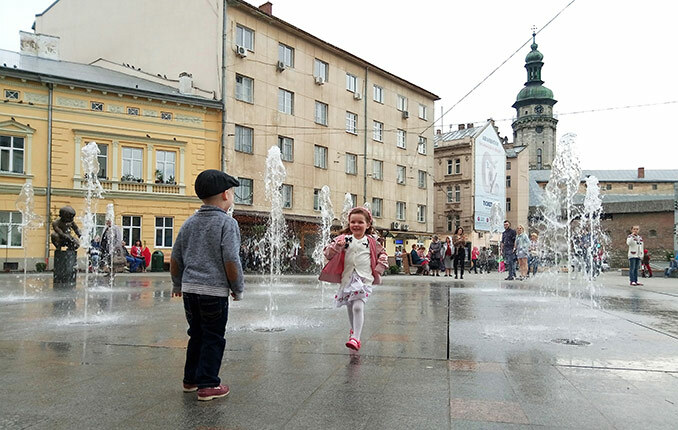 Also, on the square there is a bronze sculpture from the 1960s years – a little boy fluttering with water, stayed standing as a symbol of the past, and as a memorial from childhood and youth of many Lviv inhabitants. 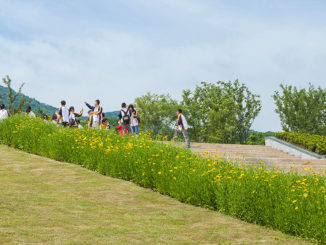 The sculpture was cleaned, refurbished and set back on the square. 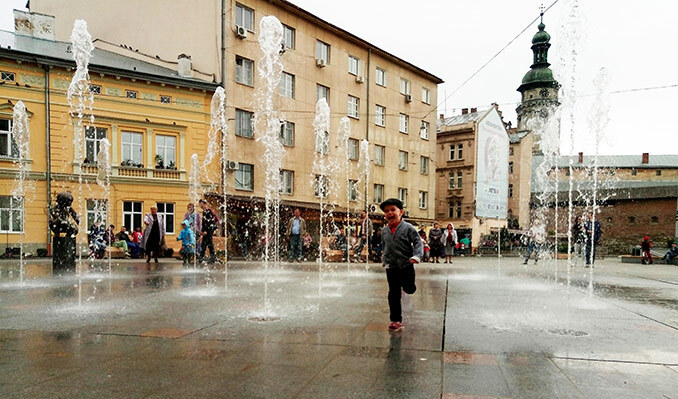 Now the boy catches the water splashes, as it was planned, but not realized in the 1960s. 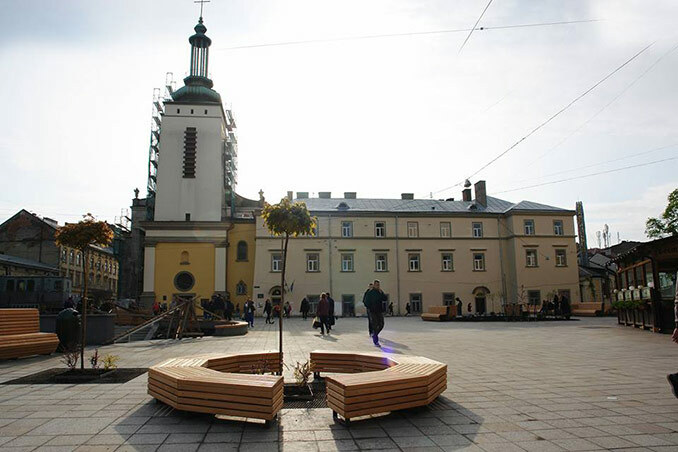 On the Mytna Square are installed in the paving about one hundred lamps, which smoothly concentrate to the entrance to the Museum – to the main dominant building, thus emphasizing the presence of this remarkable building of the former church, and today the museum with a unique collection of wooden sculptures of the Baroque master. 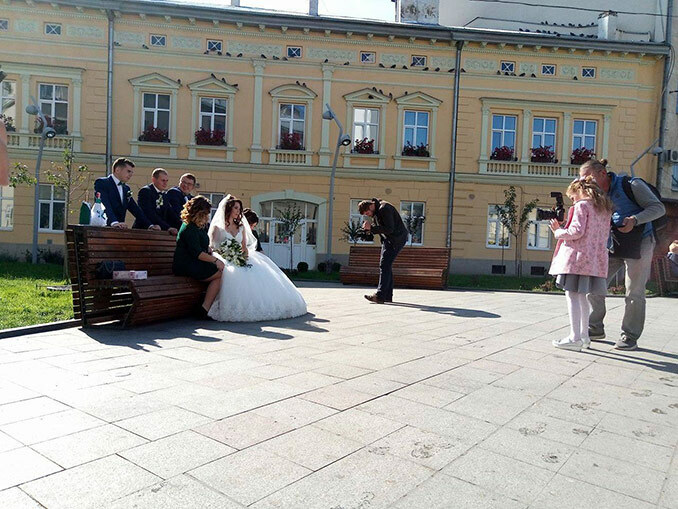 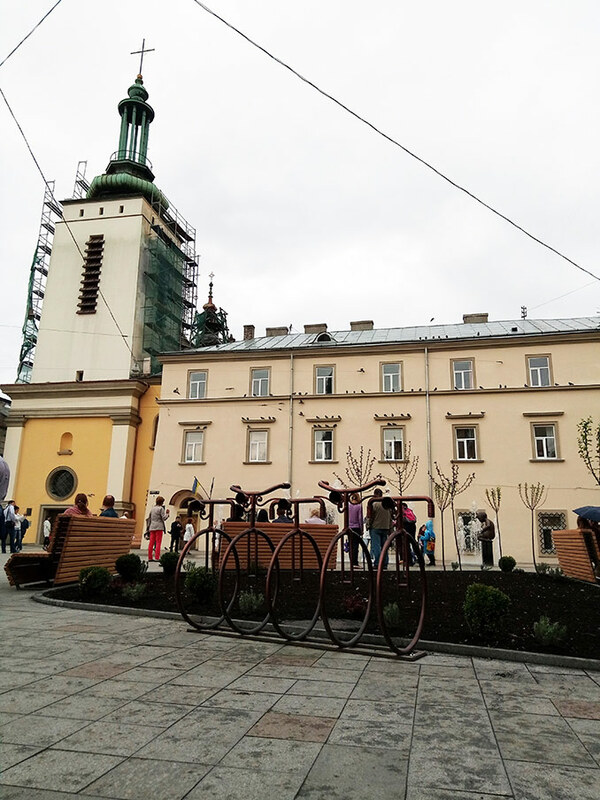 The renovation of Mytna Square was carried out by: the Department of Historical Preservation and the Lychakiv District Administration of Lviv City Council.